So what DID Pliny the Elder say about hops? What did Pliny the Elder actually say about hops? Not what you’ve been told, probably – and quite possibly he said nothing about hops at all. Thanks to the chaps at the Russian River brewery in Santa Rosa, Sonoma County, California, who named their extremely hoppy, strong “double IPA” after him, the Roman author, lawyer and military man Gaius Minor Plinius Caecilius Secundus, who died in AD 79 from a surfeit of scientific curiosity after getting too close to the exploding Mount Vesuvius, is now probably better known than at any time in the past 1,900 years. Russian River named their beer Pliny the Elder because he is supposed to be the first person to mention hops in writing, in his great survey of contemporary human knowledge, Naturalis Historia. (They named an even hoppier, stronger “triple IPA” after his nephew and heir, Pliny the Younger. But the plant that Pliny the Elder wrote about, which he said was called lupus salictarius (which translates as “wolf of the willows”, salix being the Latin for willow tree*) may not have been the hop: there’s certainly no completely convincing evidence in Pliny’s own writings to confirm that lupus salictarius and hops are the same thing. The first person to identify Pliny’s lupus salictarius as the plant that Italians call lupulo, the Spanish lúpulo, Germans Hopfen and English-speakers hops seems to have been a 16th century Bavarian botanist called Leonhart Fuchs, in a book called De historia stirpium commentarii insignes, or Notable commentaries on the history of plants. But Fuchs (after whom, apparently, the fuchsia is named), had made a big effort to try to match up “modern” plants with those mentioned by classical authors, and may have made a mistake in deciding that lupulo was derived from, and identical with, Pliny’s lupus salictarius. At least one writer has suggested that the word lupulo, far from being derived from the earlier term, may simply be an Italian error for “l’upulo“, via the French for hop, houblon, and nothing to do with lupus salictarius. In Italia paucissimas novimus, fraga, tamnum, ruscum, batim marinum, batim hortensiam, quam aliqui asparagum Gallicum vocant. Praeter has pastinacam pratensem, lupum salictarium, eaque verius oblectamenta quam cibos. Now, we can take it (though Pliny doesn’t specifically say so) that when he talks about eating plants such as black bryony (which is actually extremely poisonous, at least the berries, roots and leaves are), butcher’s broom and brambles he means eating the young springtime shoots. And young springtime hop shoots are still cooked and eaten in Belgium and elsewhere. But that doesn’t prove that by lupus salictarius Pliny meant the hop. What about the actual name lupus salictarius? You’ll find plenty of people asserting that Pliny (more properly the Romans – Pliny didn’t invent this name) called the hop “willow wolf” “because hops then grew wild among willows like a wolf in the forest”, and a book from 1834 called Medical Botany by John Stephenson declares that “according to Pliny [the hop] grew amongst willows, to which, by twining round, and choking them, it became as destructive as the wolf to the flock.” But as we have seen, Pliny never said anything like this. The Naturalis Historia gives no explanation at all for the name lupus salictarius. Mr Stephenson et al are making it up. Now, as it happens, wild hops WILL (and do) climb up trees, and quite possibly in sufficient quantities to bring the trees down with their weight, the way wolves bring down sheep and other prey. I’ve not found any descriptions of this happening, although I’ve seen wild hops growing all over hedges in great quantities in England, and the botanist Humphrey Gilbert-Carter said in his Glossary of the British Flora in 1949 that ” the hop is commonly seen climbing on the willow in the continental Auenwälder.” But that doesn’t prove that lupus salictarius is the hop, either. there arose a diminutive form out of this hoppe by the addition of an l, which explains the French houblon for houbelon as well as the Mid. Latin hubalus. Farther on, in Italy, where the plant was neither cultivated nor used, the foreign word, coalescing with the Article, became lupolo, luppolo; out of which popular name arose the later Mid. Latin lupulus, used by Italian authors. The botany of the Middle Ages was so slavishly dependent on the Graeco-Roman literature that a similar sounding name of a plant was hunted for and happily found in Pliny. There is not a word about its being a climbing plant and if the name had not resembled the Mid. Latin lupulus, no one would have thought of its meaning the hop. Now, if you want my opinion (and I’m taking it that as you’re reading this you DO want my opinion), I think it’s somewhere between possible and probable that lupus salictarius WAS the wild hop plant: Pliny puts it among other wild plants from which the fresh shoots were harvested for cooking, like asparagus, and hop shoots are still cooked today, while “willow wolf” is a good description of what hops are capable of in the wild as they grow up trees for support. But that’s a long way from “definite”, and to write as if Pliny’s lupus salictarius was unequivocally the hop plant is wrong. When the great Swedish botanist Carl von Linné attached a scientific name to the hop in 1753 he gave it the genus name Humulus, from the Swedish for “hop”, humle, and the species name lupulus from the medieval Latin word for “hop”. Even if lupus salictarius WERE the origin of lupulus, therefore, it would be wrong to say, as many websites do, that Pliny “is credited with inventing the botanical name for hops.” He didn’t: Linnaeus did. “The Hop was first mentioned by Pliny, who speaks of it as a garden plant” – no he didn’t. In fact he specifically put lupus salictarius in a section with other wild, uncultivated plants. “Hops were used and consumed by Pliny the Elder and his Roman country men for medicinal purposes.” No they weren’t. “The hop was said by the Romans to grow wild among the willows ‘like a wolf among sheep.’” No it wasn’t. “In the first century AD, Roman naturalist Pliny the Elder named the plant Lupus salictarius or ‘willow wolf’ because of its habit of climbing up willow trees and strangling them.” No he didn’t. Pliny didn’t give lupus salictarius a name, he repeated the name others had given it earlier. We don’t know why it was called “willow wolf”, we can only guess. And now it’s time for the obligatory advert: my book Amber Gold and Black, the definitive bible of British beer styles, the most comprehensive history of the origins of everything from porter to mild, bitter to stout, is now out and available (despite what it says on the Amazon website) and you can order it here for less than the price of four pints of beer. Buy it, read it, enjoy it, stun your friends with your suddenly vastly enhanced beery knowledge. * Russian River Brewing’s own website translates lupus salictarius as “wolf among scrubs”, evidently borrowing this from messers Rabin and Forget and their Dictionary of Beer and Brewing. They’re wrong. This apparently dates from around 55BC, during Caesar’s excursions into Britannia. Pingback: Russian River Review « Live. Taste. Reach. So interesting. I ended up here while researching the meaning of the beer’s name. Thanks for the insight. Thanks – writing a fiction picture book about Pliny. Good to know more before I illustrate the borders with hops, lovely as they are! It seems to me that you confound two distinct questions: whether Pliny’s ‘lupus salictarius’ was the hop plant and whether ‘lupus salictarius’ is the origin of ‘lupulus’. It is patent that ‘lupus salictarius’ is the origin of ‘lupulus’, for the Mediaeval botanists explicitly refer to Pliny’s ‘lupus salictarius’ as the hop plant, however botanically haphazard that may be. Linné assumes the the botanical name for the plant from that tradition. This is true independent of whether the Germanic ‘Hoppe’ via French ‘Houblon’ is the etymological origin of ‘lupolo’, or the other way around. 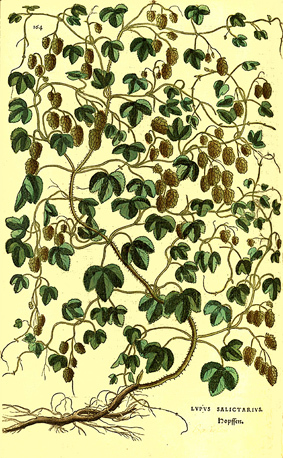 If the etymological influence of Pliny’s ‘lupus salictarius’ begins only some thousand years after his Naturalis Historia due to the mediaeval botanists wading through books looking for plant names that sound similar to ‘hubalus’ or ‘lupulo’, the most wonderful scenario is that Pliny did indeed refer to the hop plant. For then it is the most remarkable coincidence that the ascensional and wolfy aspects of the hop plant are brought together at a point in time when ‘hüpfen’ (through ‘hopfen’ through ‘houblon’ etc.) has come to sound the same as ‘lupus’! And Hop shoots have surely been harvested and prepared for food in Italy for centuries. Whether that was the case 2000 years ago, I don’t know. As you point out, Pliny’s ‘lupus salictarius’ is a wild plants from which the fresh shoots are harvested for cooking. Furthermore, Pliny describes it as a delicacy, which accords perfectly both with the seasonal nature and the taste of fresh shoots. If Pliny’s ‘lupus salictarius’ is not the hop plant, what is it then? I meant to say “It is patent that ‘lupus salictarius’ is the origin of ‘lupulus’”. I didn’t pay attention to the program automatically changing ‘lupulus’ into ‘lupus’. I’ve edited your original comment to read the way you meant it to. Well, I think it’s truer to say that Linneus’s name for the hop plant was influenced by both lupulo and lupus salictarius, and the first still probably doesn’t have anything to do with the second. Pingback: Historia chmielem pisana z rzymianami w tle. Thank you very much, Ellen, pedantic Latinists always very welcome around here, and I have altered the copy to take account of your correction.